When: Tuesday, April 14, 2015 6:30 p.m. 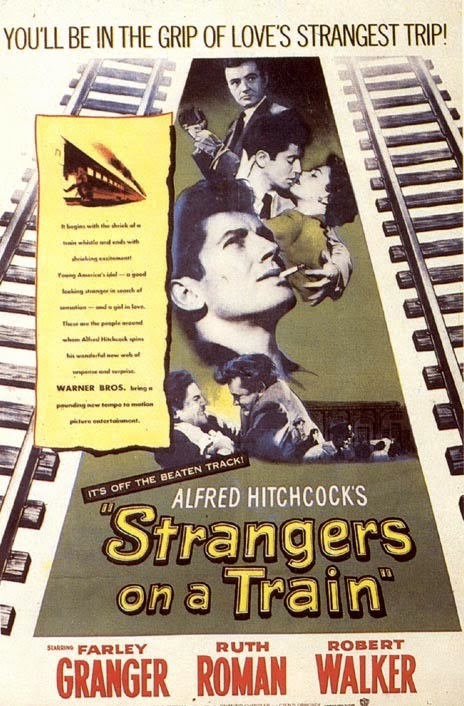 When an amateur tennis star (Farley Granger) meets a rather strange and disturbed man (Robert Walker) on a train, a weird nightmare begins. Bruno Antony (Walker) tries to convince tennis player Guy Haines (Granger) that they should “swap murders.” Anthony goes on to explain how much he’d like to get rid of his father and that he’s read how Guy’s failed marriage to Miriam (Laura Elliot) is getting in the way of his relationship with Anne Morton (Ruth Roman). While Guy laughs off the swapping murder idea proposition, Bruno takes it seriously and kills Guy’s wife. When Guy fails to murder Bruno’s father, Bruno threatens to expose Guy as a murderer, destroying his tennis career and his relationship with Anne. Considered one of director Alfred Hitchcock’s best films, it includes one of the most memorable climaxes in movie history.